Eat healthy and support local! SoFresh arrived in Tampa in 2013. Their mission is to help diners eat right, save time and feel healthy. They have locations in North Tampa (2774-A East Fowler Avenue), South Tampa (533 South Howard Avenue) and now in the heart of downtown (512 North Franklin Street). They’re open for breakfast, lunch and dinner seven days a week. Their bowls are packed with nutritious flavor. Early risers indulge in the breakfast bowl, which feature sweet potato, brown rice, quinoa, tomatoes, onions, jalapenos, bacon, avocado and two poached eggs topped with your choice of chicken, peeled shrimp, steak, flax encrusted ahi or salmon. 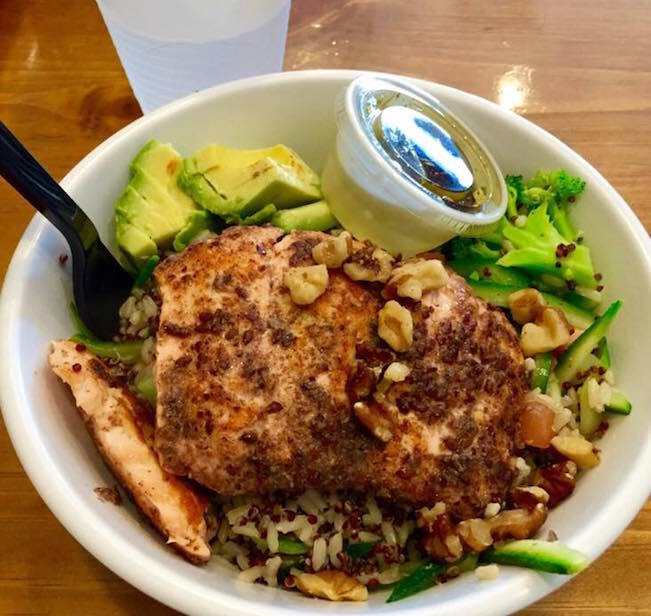 The superfood bowl features a mix of red quinoa and brown rice with tomatoes, broccoli, walnuts and avocado with your choice of protein. A popular addition to most orders are their famous Zoodles — zucchini noodles. Their salads reinvent the dish. The signature salad features baby spinach with goat cheese, avocado, raisins, sunflower seeds and tomatoes covered in home balsamic vinaigrette. Their Granny salad comes with crumbled bacon, green apples, raisins and walnuts, and their Mediterranean comes with chickpea, red onion, baby spinach with feta cheese covered in homemade garlic herb vinaigrette. All salads come with your choice of protein. Wrap up lunch with these healthy to-go options. For those looking to get in and out during their lunch break, SoFresh offers a variety of wraps filled with energizing proteins and veggies. Our favorite is the pesto club — bacon, white cheddar, tomato and homemade kale-basil pesto wrapped in flour tortilla. SoFresh also offers a selection of juices and smoothies. The Surfer, made with all-natural kale, pineapple, mangoes, apples and honey, is a must try for first time visitors. The new downtown location is Monday through Friday, 11am-9pm, and Saturday and Sunday, 11am-8pm.